In today’s world, there seems to be a perception that farm-raised seafood is inferior to wild-caught seafood. Farmed oysters are a very sustainable choice and equally lovely compared to their wild counterparts. Don’t believe us? Read more for the proof. Lately, there has been a lot of excitement at Pangea about the new oysters coming into our shop. This week, we have another addition! Don't they just look stunning? And I promise, they taste just as amazing. Barnstable Harbor is known for producing some of the Atlantic's best oysters like our Thatch Islands, and the Wild Thirty-Ones are no exception. These wild oysters are pretty special not only in look and flavor, but also in how they are harvested: they are hand-picked at low tide and exclusively harvested by a local Native American tribe. Their shells have deep green hues that reflect the ocean bottom they have been growing on. When it comes to taste, the best word to describe them would be dynamic. 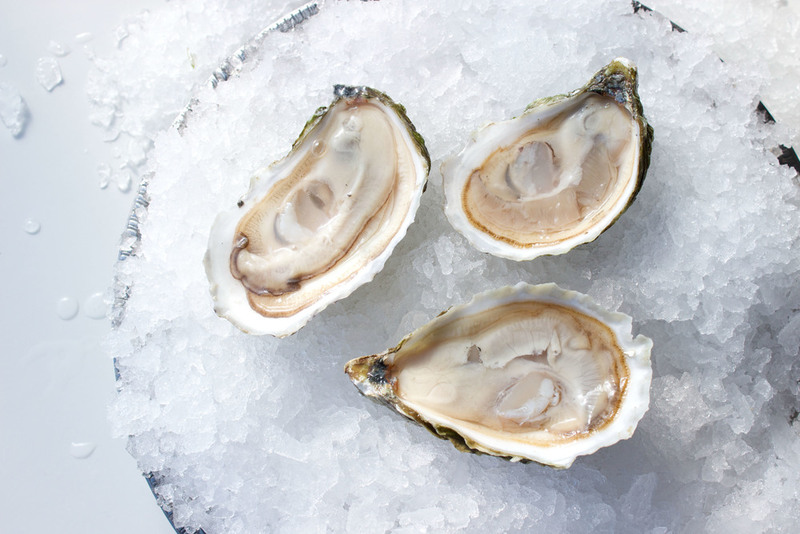 The oysters have deep cups allowing for plump meats that are sweet and briny. And after you swallow the oyster, you are left with a nice ocean finish. These oysters are a seasonal addition, so make sure to get them while they are here! For full Oysterology details, click here. Farmed versus Wild Oysters -- Is One Better Than the Other? Lately, there has been a growing perception that farmed seafood products are inferior to wild products. There has been a lot of consumer confusion on what is the healthy or sustainable choice. Although we can't speak for the fish industry, we can definitely clear up any confusion on oysters! Watch Dan's video to learn the differences and similarities between wild and farmed oysters. Dan, is there a difference between farmed versus wild [oysters]? Yes, absolutely there’s a difference. As the name suggests, wild oysters are out in the wild. They don’t get touched prior to being harvested, so they are a "little rough around the edges," so to say. The farmed oysters are quite a bit more consistent in shell shape from one to the next. This [shell] is pretty and very consistent in what I would find in a 100 count bag of farmed oysters. Typically, wild oysters will grow a little bit slower than farmed oysters, which allows their shells to harden up a little more and also allows them time to grow their meat content, so the meat content tends to be a little bit more. On the flip side, farmed grow a little bit faster. That is usually by choice. Farmers want to get their product out to the market as fast as they can, typically anywhere from 18 month to 36 months. What makes oyster farming unique versus other types of seafood farming? What makes oyster farming unique is that it actually takes place out in the wild. So, these oysters are literally growing out in the harbor (these are actually Mayflowers from Dennis, MA). So you go out in to Cape Cod Bay, and you’ll find these oysters sitting in cages out there, eating the same food as any wild oyster would in that same area. Their getting the same water so they have the same flavor. Most of the fish farming that goes on is in secluded areas, all approved areas. They have to be fed certain foods. It’s not fish swimming around in the ocean gathering their own food, so there’s definitely a difference between the two, which makes oyster farming unique. Same as fish farming, [oyster farming] makes oysters sustainable at the same time. I’d say over the past ten years, oyster farming has really overtaken the wild fisheries. A lot of the wild fisheries have been overfished just like fishing, and the numbers have really dwindled over the last ten years. When it comes to chefs and restaurants, is there a preference for wild or farmed oysters? I don’t think so. I think most chefs are just looking for a good quality oyster, something that presents well in a showcase, has good meat content, and also has good flavor. In my experience with the restaurants we sell to in Boston, they’re really looking for recommendations to spruce up their raw bar whether it’s a wild unique oyster or a farmed beauty. It doesn’t really matter. I think they’re just looking for the quality.